Given a binary tree, print the bottom view from left to right. A node is included in bottom view if it can be seen when we look at the tree from bottom. For the above tree, the bottom view is 5 10 3 14 25. If there are multiple bottom-most nodes for a horizontal distance from root, then print the later one in level traversal. For example, in the below diagram, 3 and 4 are both the bottommost nodes at horizontal distance 0, we need to print 4. For the above tree the output should be 5 10 4 14 25. The first line of input contains T denoting number of testcases. T testcases follow. Each testcase contains two lines of input. The first line contains the number of edges. 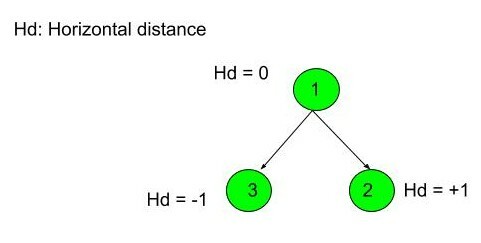 The second line contains the relation between nodes. The function should print nodes in bottom view of Binary Tree. Your code should not print a newline, it is added by the caller code that runs your function. Testcase 1: First case represents a tree with 3 nodes and 2 edges where root is 1, left child of 1 is 3 and right child of 1 is 2. Thus nodes of binary tree will be printed as such 3 1 2.